We enjoy making polenta and Gary told me about a secret family recipe of his Aunt Bing’s called Polenta Torta. I love making cakes, and this savory polenta layer cake sounded so gooey and good. I never had the chance to try Aunt Bing’s original recipe but this vegan version takes the cake! 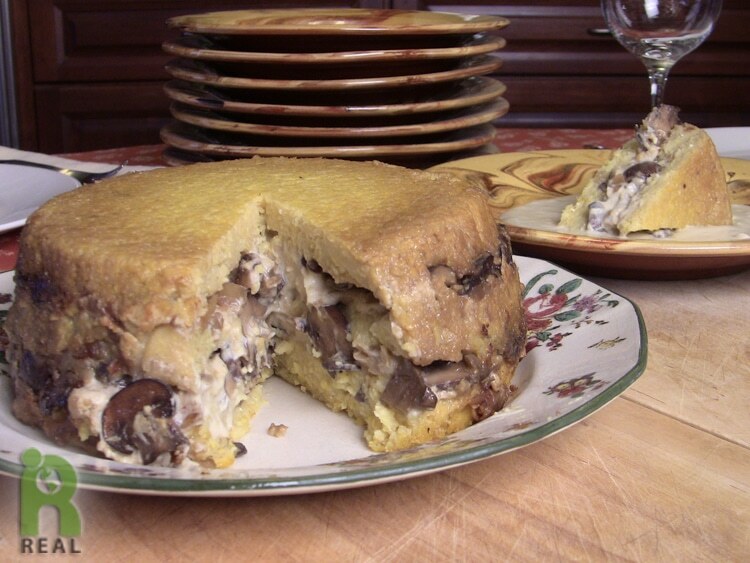 If you don’t like mushrooms, like Gary, this recipe also works well layered with artichoke hearts. It’s rich with a creamy cashew cheese “Mornay” sauce. Make the polenta base and start soaking the cashews for cream one day before. Lightly oil an 8 inch souffle dish. Set aside. In a medium saucepan, stir the polenta in the vegetable stock. Cook on medium high heat until mixture boils. Turn heat down to medium-low and continue to cook, stirring regularly until mixture is thick and creamy, about 30 minutes. Pour into souffle dish and let cool. Polenta should be made a day in advanced and refrigerated until ready to assemble. 2. Place in a large jar, cover with water, double the volume of the cashews, about 4 cups. Cover and let soak overnight. 3. Drain water, rinse cashews and put in blender. Pour water in the blender, enough to just reach the level of the cashews, not more. For a very thick cream use less water. Blend until smooth. 4. Pour in a container and place in the refrigerator until ready to use. Lasts 3-4 days. Cashew cream may be frozen. Peel and chop onions. Clean mushrooms. Slice into thin pieces. Lightly oil a heavy skillet or fry pan. Turn heat to medium high. Add onions and cook, stirring occasionally, until they are soft. Turn down heat if onions start to brown. After 5 minutes add in mushrooms. Cook another 10 minutes. Remove from heat. In a small saucepan, whisk together cashew cream, miso, yeast and starch. Turn heat to medium high and whisk mixture until is starts to thicken. Lower heat and cook mixture for five minutes to remove starch taste. When mixture is thick and creamy, remove from heat. (Recipe can be doubled in order to have extra cheese sauce to top on each slice while serving). To remove the polenta from its dish: take a knife and go along the sides, making sure polenta is not sticking. Apply a small amount of pressure inwards to lift up from the bottom edges. With one hand on the top of the polenta, turn dish over. Lightly jiggle until polenta comes out. Place on a cutting board. Divide the polenta into 3 even layers. This can be done by slicing it with a long serrated knife or by using dental floss. Holding a long string of floss tightly, gently pierce the polenta where you want it to be sliced. Move the floss around the circle, piercing the polenta and “cutting” it through the middle until all the way through to the other end. Put each layer on a separate plate. Wipe the souffle dish with olive oil. Take the layer that originally came from the bottom of the dish and put it back into the souffle dish. Drizzle with a teaspoon of melted vegan butter. Tope with 1/2 of the mushroom/onion mixture. Even out the layer and top with about 5 tablespoons of cashew cheese filling. 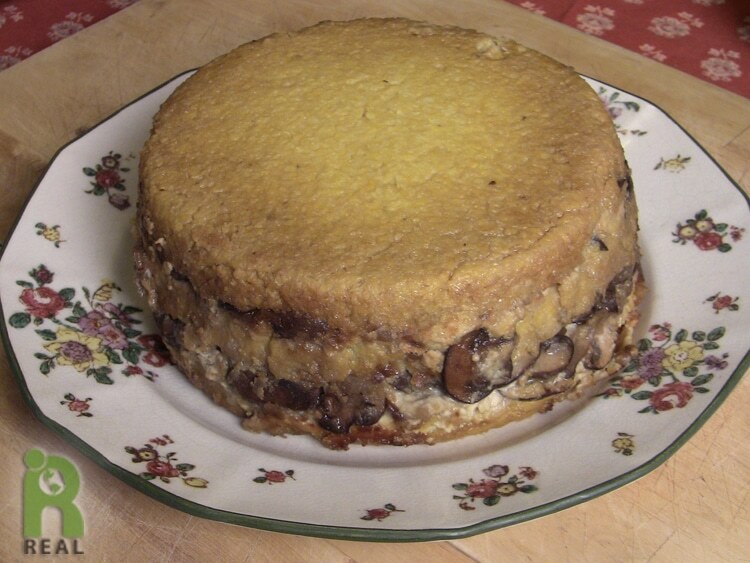 Place the middle polenta layer on top and repeat with melted vegan butter, the remaining mushrooms and onions and cashew cheese filling. Top with the last polenta layer and drizzle with remaining melted vegan butter. Place polenta dish in the oven on the center rack. Cover top with a piece of parchment paper. Cook for 30 minutes. Remove paper cover and cook another 30 minutes. Remove from oven and allow to set for 30 minutes. Place a large plate on top of the dish and carefully turn it upside down so that polenta will come out on the plate. It is now ready to serve. Serves 8 to 10.